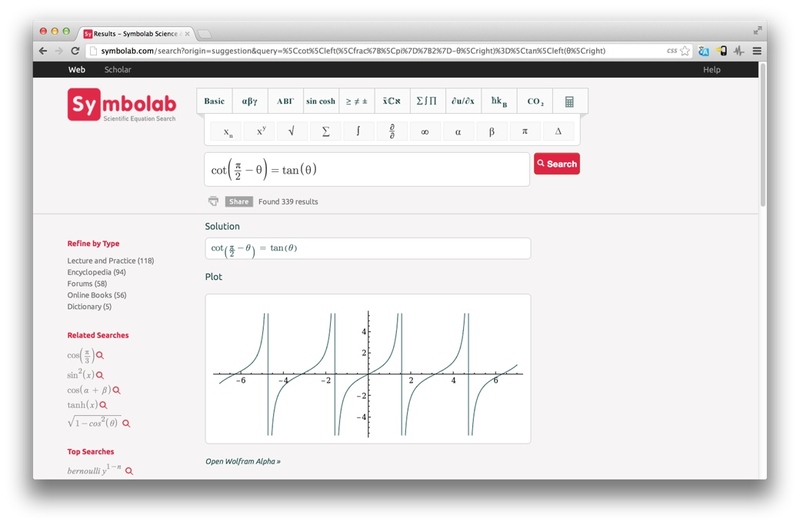 Symbolab is a search engine for students, mathematicians, scientists and anyone else looking for answers in the mathematical and scientific realm. Other search engines that do equation search use LaTex, the document mark up language for mathematical symbols which is the same as keywords, which unfortunately gives poor results. Symbolab uses proprietary machine learning algorithms to provide the most relevant search results that are theoretically and semantically similar, rather than visually similar. In other words, it does a semantic search, understanding the query behind the symbols, to get results. The nice thing about math and science is that it’s universal – there’s no need for translation in order to understand an equation. This means scale can come much quicker than other search engines that are limited by language. I interviewed Michal Avny, the CEO of Symbolab, to find out more about this new search engine. Tell us about your background. Is this the first time you’ve founded a company? I’m a technologist and entrepreneur at heart. I was the CEO of Relegence IL, a pioneer in the real-time search technology, and lead it to a successful acquisition by AOL in 2006. How did you find / pull together the team? Adam and Lev are longtime friends. When I met them I instantly knew this is a winning team to build a new startup. We are all mathematicians, and Lev and myself have years of experience with search engines. Among the three of us we had all the know-how to build Symbolab. Adam is the scientist responsible for the patents and algorithm development, Lev is the techy doing most of the development and I’m responsible for the strategy & operations. We all have capabilities that overlap, we complement each other. Where did the idea for Symbolab come from? Symbolab emerged from Adam’s frustration as a graduate student. He found there was no good way to search mathematical content on the Internet. When Adam first mentioned this it immediately clicked. I come from the world of search and information retrieval, where you deal with text, but scientific symbols and notations are an untouched ground. You come from the world of search – tell us more about that. I come from the world of information retrieval, where you not only search for documents but you also try to automatically understand for instance the entities and topics of a document and the relationships between them. I was forming real-time search systems before ‘real-time’ was a common term. My passion is with search and information extraction. Google uses mainly keyword search, Symbolab uses semantic. Why is semantic search important for mathematical / scientific search? Semantic search is important because science is a language with its own syntax, grammar and vocabulary. Each symbol can mean different things within and across disciplines, order and position of elements matter, priority of features, etc. Keyword search that works pretty well on text doesn’t work as well on scientific expressions. You say “Each symbol can mean different things within and across disciplines, order and position of elements matter, priority of features, etc.” Can you give an example of this? What other search engines do equation search? Keyword search (using LaTex) on Springer journals. Text search on a set of equation dictionary. LaTex search, small set of equations covered. Enterprise search – the enterprise search market revenue is estimated at $2.5 billion USD with a growth of 22% per year. Digital library services – there are around 3,000 institutions worldwide that spend on average approximately 1.2 million USD each on digital content. Web search – we believe that a mathematical notations search engine publicly available on the web can make the biggest impact on how we search and discover scientific content, it is essential for a wide population worldwide including high school students, college students, researchers and professionals. We estimate the page views per day as being 4% of the total of Google traffic. Do you plan on building an ad network? We do have plans to build an ad network. Leading scientific publishers are making billions of USD a year from advertising. Scientific content is one of the most expensive forms of digital content available today. Wolfram is great, but it’s a knowledge base not a search engine. It’s very much like comparing Wikipedia to Google. What do you think of people who claim women aren’t good at math? Ignorant. Women are as good as men in math & science. We also don’t see that many women entrepreneurs. It is not about capabilities, women are just as capable. I truly believe the nature of the problem is in the education system. There are still different expectations from women than from men. Symbolab can open a window to science and help women overcome the barrier of the scientific language. You just closed an investment. From who? How much? We closed 500,000 USD in May 2011 from a group of investors in Israel and London. The group is lead by Micha Malka, former CEO of Harel Finance. What do you wish someone told you when you started as an entrepreneur? Find the right people and don’t compromise. Keep it lean, very lean.